All conference sessions (excluding optional training and some social events) will be held here. The rate is guaranteed until July 5, 2019 or until the conference block is sold out, whichever comes first. To reserve by phone, call 503-226-1611 with Group Code CNU and mention the 2019 CollegeNET User Conference or RESERVE ONLINE. 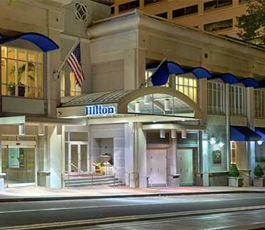 $192 plus tax per night, single or double occupancy in The Hilton Portland Downtown.